Hans-Wolfgang Riedl – Austrian intermediary; convicted of bribery by an Austrian court in April 2013 and sentenced to three years in prison. Conviction upheld by the Austrian Supreme Court. Walter Wolf – Canadian-based businessman and intermediary in the Croatian and Slovenian deals. Indicted in Austrian and Slovenian courts but not tried in absentia. Janez (Ivan) Janša – former Slovenian prime minister. Convicted of taking bribes and sentenced to two years in prison. Judgment overturned by Slovenia’s Constitutional Court. Heikki Hulkkonen – former vice president of Patria Vehicles; convicted of bribery by a Finnish court in relation to the Croatian deal, overturned on appeal; acquitted of bribery in the Slovenian case. Reijo Niittynen – former Patria country representative in Croatia and Slovenia; convicted of bribery by a Finnish court in relation to the Croatian deal, overturned on appeal; acquitted of bribery in the Slovenian case. Jorma Wiitakorpi – CEO before 2008; forced to resign because of Egypt investigation, indicted in the Slovenian case and acquitted. At least three of Patria’s arms deals over the past 20 years have been implicated in bribery investigations. In 1999, a Patria subsidiary, Patria Vammas Oy, signed an agreement with the Egyptian state-controlled company Abu Zaabal Engineering Industries (AZE) to set up a local production line for 155 mm towed artillery at a cost of between USD 17 and USD 21 million. The agreement was implemented over the next five years by Finnish experts working in Egypt. According to later reports and the allegations of a Finnish whistleblower, the artillery units failed to meet requirements and were, notably, too heavy to operate in the desert sand. Patria also competed against heavy competition throughout Eastern Europe for armored vehicles contracts during the 2000s, winning significant orders in Poland, Slovenia, Croatia, and Estonia. In Slovenia, it was selected to provide 135 of its AMV armored personnel carriers in 2006 at a cost of EUR 278 million. Over the course of 2007 and 2008, it was awarded two similar contracts for a total of 126 AMVs for EUR 238 million from the Croatian armed forces, with part of the vehicle assembly to be performed by local firm Djuro Djakovic. In 2012, following the emergence of bribery allegations, the Slovenian deal was reduced to 30 AMVs at a price of EUR 75 million. The Egyptian bribery scheme came to light when one of Patria’s agents, technical expert Lt. Col. (retd.) Erkki Heinilä, approached Patria leadership to express his dissatisfaction with the output of the licensed production line run by AZE. Heinilä was upset that the Patria leadership failed to address his concerns, and brought the story—including allegations of bribery—to journalist Jyri Raivio in March 2007. According to Heinilä, the senior leadership of Patria, including CEO Jorma Wiitakorpi were aware of kickbacks paid to executives at AZE as part of the partnership. These kickbacks, worth 9% of the deal’s value, were allegedly paid through Wasfi & Wafik Doss & Company, a local intermediary. In February 2007, a branch of the Austrian Raiffeisen bank flagged a large money transfer among the middlemen involved in the two Balkan deals and brought it to the attention of Austrian financial authorities. Hans-Wolfgang Riedl, a Patria agent in Austria, sent around EUR 2.3 million to Walter Wolf, a Canadian-based intermediary, who sent the money on to accounts in Australia, Liechtenstein, and East Asia. The Austrian authorities reached out to Finnish and Slovenian counterparts, prompting investigations in both jurisdictions. In both the Slovenian and Croatian cases, prosecutors surmised that Patria had made payments to decision-makers who could influence the outcome of the hotly contested armored vehicles tenders. In Slovenia, the decision-maker would have been Prime Minister Janez Janša; in Croatia, the suspects were President Stjepan Mesić, former Prime Minister and senior statesman Franjo Gregurić, and Bartol Jerković, the director of a state-owned arms- and vehicle-manufacturing corporation. In the Egyptian case, four Patria executives, including the head of Patria Vammas Markku Murto, and a sales agent, Margret S. Ibrahim, were brought to trial in Finland. Prosecutors also filed charges against Patria itself as a corporate defendant. While not indicted, CEO Wiitakorpi was forced to resign in 2008. In June 2011, a court found the four executives guilty of aggravated accounting offences and gave them suspended prison sentences, while dismissing charges against the company. Three of the convictions were upheld on appeal in 2013. The more serious charge of foreign bribery was rejected by both the lower court and on appeal. Under Finnish law, foreign bribery applies to payments to foreign public officials only, and the courts ruled that the Patria executives may not have known that AZE was a state-controlled enterprise because the Patria executives did not consider themselves to be state officials despite working for a majority-state-owned firm. Egyptian authorities did not seek charges against those implicated in the case, and were unhelpful to Finnish authorities. In both the Slovenian and Croatian cases, Finnish prosecutors were unable to secure judgments against Patria executives despite cooperation between the three countries. In the Slovenian case, a Finnish district court rejected in January 2014 aggravated bribery charges against six persons and the firm; the decision was upheld by the Court of Appeal in 2016. The accused included former CEO Wiitakorpi, Patria Vehicles vice-president Heikki Hulkkonen, Slovenia sales representative Reijo Niittynen, marketing executive Tuomas Korpi, and chief financial officer Kai Nurmio. The court ruled that prosecutors had failed to prove the executives’ knowledge of bribes, as well as the recipients’ acknowledgement of the payments as a bribe. In February 2015, a Finnish court convicted Hulkkonen and Niitynen of bribery in relation to the Croatia deal and sentenced the two to 20 months in prison. The court also endorsed charges against a Patria subsidiary. In February 2016, however, the convictions were overturned by a Court of Appeal. The appeals court ruled that certain coded messages in emails between executives could not be conclusively shown to be evidence of knowledge of bribery. In Slovenia, prosecutors initially focused their attention on former Defence Minister Karl Erjavec and former Chief of the General Staff Albin Gutman, who were key decision-makers in the armored vehicles deal. The two were acquitted, however, in a 2011 trial. In the same year, prosecutors began proceedings against former Prime Minister Janez Janša, political ally Jože Zagožen, the owner of a Slovenian industrial partner, Ivan Črnkovič, and military officer Tone Krkovič. They also sought to bring charges against intermediary Walter Wolf. Both Wolf and Zagožen were removed from the case, however, the first because he could not be apprehended in Canada, and the latter due to illness and later death in fall 2013. A lower court ruled in June 2013 that Janša, Krkovič, and Črnkovič were guilty of receiving gifts to influence the tender; Janša was given a two-year prison sentence, while Krkovič and Črnkovič were handed 22-month terms. Former Slovenian Prime Minister Janez Janša speaks to the press on June 5, 2013, following his conviction on corruption charges by a lower court. The judgment was eventually overturned by the Constitutional Court. Getty/AFP, Jure Makovec. The court’s judgment found that in August 2005, Zagožen had negotiated on Janša’s behalf a commission with Hulkkonen and Niittynen to ensure Patria’s victory, to be hidden in the 7.5% commission Patria had negotiated with intermediary Hans-Wolfgang Riedl. The bribe would be drawn from Walter Wolf’s 4.2% sub-commission. In August 2006, Patria representatives signed an agreement to pay 30% of the promised commission within 30 days of a final purchase contract being signed between the Slovenian ministry of defense and Črnkovič’s firm, which would act as Patria’s local partner. In February 2007, Patria Vehicles paid EUR 3.6 million to Riedl, who in turn transferred EUR 2.3 million to Wolf. In addition, the court found that the defendants had arranged to insert Črnkovič’s firm, Rotiš d.o.o., as Patria’s industrial partner in Slovenia, and for the firm’s profits to be split between the defendants and Janša’s Slovenian Democratic Party. In April 2015, Slovenia’s Constitutional Court annulled the judgment and remanded the case to the local court in Ljubljana on the basis that the court did not prove that Janša had accepted the promise of a reward. The higher court ruled that the initial judgment did prove that a payment existed, and that the receiver intended to use his influence to intervene, but did not independently prove that Janez had accepted the bribe. The possibility of a retrial was eventually dropped because too much had time had elapsed since the original suspected offenses. Croatian authorities did not act on the information revealed to it by partners in Austria, Finland, and Slovenia. In Austria, however, a Vienna court sentenced middleman Hans-Wolfgang Riedl to three years in prison and fined him EUR 850,000 for bribery and tax fraud offenses. Riedl’s partner, Walter Wolf, was indicted but not placed on trial in absentia. Three other co-defendants were acquitted. Two had been accused of helping Riedl obtain documents from Austrian arms manufacturer Steyr, a subsidiary of General Dynamics Land Systems Europe and competitor of Patria. In June 2015, the Austrian high court confirmed the verdict, noting that the prosecutors had shown that Wolf passed EUR 900,000 to Zagožen in February 2007 as part of the advance commission payment demanded by Janša. Despite the multiple scandals, Patria was able to find a new investor, Norway’s Kongsberg Group, in 2016 having lost its partnership with Airbus in late 2014. Patria is now considering a sale of its AMV armored vehicle line, weighing alternative offers from BAE Land Systems and Polish partner PGZ. 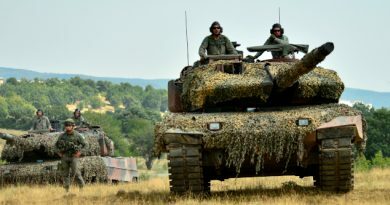 Image Caption: Croatian soldiers board a Patria AMV during exercises in Hohenfels, Germany, on May 23, 2015. Image Source: U.S. Army/Spc. John Cress, Jr.
“Patria Suspected of Bribery in International Contracts,” YLE, May 14, 2008, https://yle.fi/uutiset/osasto/news/patria_suspected_of_bribery_in_international_contracts/5836754. “Arrest in Patria Bribery Case,” YLE, July 31, 2008, https://yle.fi/uutiset/osasto/news/arrest_in_patria_bribery_case/5845642. Leander Schaerlaeckens, “Patria CEO steps down during bribery probe,” UPI, Aug. 21, 2008, https://www.upi.com/Patria-CEO-steps-down-during-bribery-probe/51911219345237/. Magnus Berglund, “The Truth About Patria,” YLE TV1, Sep. 1, 2008, https://yle.fi/aihe/artikkeli/2008/09/01/truth-about-patria. “Slovenia graft scandal takes new turn,” b92 (online), Sep. 8, 2008, https://www.b92.net/eng/news/region.php?yyyy=2008&mm=09&dd=08&nav_id=53317. “Bribery Charges to be Filed against Patria,” YLE, June 23, 2010, https://yle.fi/uutiset/osasto/news/bribery_charges_to_be_filed_against_patria/6159524. “Paha Patria on pestävä syvältä [The evil in Patria requires a deep cleaning],” Talouselämä (online), Sep. 16, 2010, https://www.talouselama.fi/uutiset/paha-patria-on-pestava-syvalta/34df9cfd-f8d3-3605-905b-3509f6749f52. Daniel McLaughlin, “Ex-Slovenian PM on trial for bribery,” The Irish Times (online), Sep. 6, 2011, https://www.irishtimes.com/news/ex-slovenian-pm-on-trial-for-bribery-1.591641. Shana Marshall, “Egypt’s Other Revolution: Modernizing the Military-Industrial Complex,” Jadaliyya (website), Feb. 10, 2012, http://www.jadaliyya.com/Details/25246/Egypt%60s-Other-Revolution-Modernizing-the-Military-Industrial-Complex. “Patrian käräyttäjä [Patria’s Whistleblower],” Talouselämä (online), Jan. 17, 2013, https://www.talouselama.fi/uutiset/patrian-karayttaja/a20274a8-f346-31de-8900-e296799937ec. “Patria begins appeal in Egyptian bribery case,” YLE, Feb. 26, 2013, https://yle.fi/uutiset/osasto/news/patria_begins_appeal_in_egyptian_bribery_case/6513069. “Slowenischer Panzerkauf: Lobbyist in Wien verurteilt [Slovenian Tank Purchase: Lobbyist Convicted in Vienna],” Die Presse (online), Apr. 5, 2013, https://diepresse.com/home/wirtschaft/economist/1385157/Slowenischer-Panzerkauf_Lobbyist-in-Wien-verurteilt. “Ex-Slovenian PM Janez Jansa convicted of corruption,” BBC News (online), June 5, 2013, https://www.bbc.com/news/world-europe-22781752. Kathryn Blaze Carlson, “Who is Walter Wolf and why is he wanted?” The Globe and Mail (online), July 20, 2013, https://www.theglobeandmail.com/news/national/who-is-walter-wolf-and-why-is-he-wanted/article13330221/. “Report: Ex-Croatian president suspected of taking bribes,” b92 (online), Oct. 2, 2013, https://www.b92.net/eng/news/region.php?yyyy=2013&mm=10&dd=02&nav_id=87862. “Former president denies involvement in Patria deal,” tportal.hr (online), Oct. 2, 2013, https://www.tportal.hr/vijesti/clanak/former-president-denies-involvement-in-patria-deal-20131002/print. “Finnish court rejects Slovenian bribery charges against Patria,” YLE, Jan. 30, 2014, https://yle.fi/uutiset/osasto/news/finnish_court_rejects_slovenian_bribery_charges_against_patria/7060218. “Slovenian court confirms jail sentence for ex-PM Jansa,” Reuters, Apr. 28, 2014, https://www.reuters.com/article/us-slovenia-corruption/slovenian-court-confirms-jail-sentence-for-ex-pm-jansa-idUSBREA3R0UL20140428. Lower Court ruling in the trial of Janez Janša, as released by a pro-Janša campaign group, Oct. 30, 2014, http://www.publishwall.si/odbor2014/post/281204/judgement-in-the-name-of-the-people. “Slovenian ex-PM loses libel appeal against Yle,” YLE, Jan. 13, 2015, https://yle.fi/uutiset/osasto/news/slovenian_ex-pm_loses_libel_appeal_against_yle/7735594. “Patria executives found guilty of bribing Croatian officials,” YLE, Feb. 16, 2015, https://yle.fi/uutiset/osasto/news/patria_executives_found_guilty_of_bribing_croatian_officials/7809283. Sven Milekic, “Croatia’s Mesic Named in Finnish Bribery Trial,” Balkan Insight (online), Feb. 17, 2015, http://www.balkaninsight.com/en/article/finish-arms-company-officials-sentences-cause-suspicions-in-croatia. “Franjo Gregurić glavni kriminalac u Hrvatskoj? [Is Franjo Gregurić the main criminal in Croatia],” HOP.com.hr (online), Mar. 11, 2015, https://www.hop.com.hr/2015/03/11/franjo-greguric-glavni-kriminalac-u-hrvatskoj/. “Case Number Up-879/14: Decision,” Constitutional Court of the Republic of Slovenia, Apr. 20, 2015, http://odlocitve.us-rs.si/en/odlocitev/AN03769. “Patria Scandal: From Plans to Equip Army to Verdicts and Retrial,” The Slovenia Times (online), Apr. 23, 2015, http://www.sloveniatimes.com/patria-scandal-from-plans-to-equip-army-to-verdicts-and-retrial. “OGH bestätigt Wiener Patria-Urteil [Austrian Supreme Court affirms Vienna Court’s Patria Judgment],” ORF.at (online), Apr. 24, 2015, https://volksgruppen.orf.at/slovenci/meldungen/stories/2716723/. S. Veljković, “Bartol Jerković i dr. nisu primili mito [Bartol Jerković and others did not receive bribes],” sbplus (online), July 1, 2015, http://www.sbplus.hr/slavonski_brod/crna_kronika/bartol_jerkovic_i_dr_nisu_primili_mito_.aspx. “Police probe Yle’s handling of Patria corruption allegations,” YLE, Sep. 10, 2016, https://yle.fi/uutiset/osasto/news/police_probe_yles_handling_of_patria_corruption_allegations/9158552. “High acquittal rate jeopardises Finland’s efforts to combat foreign bribery,” OECD Press Release, Mar. 23, 2017, http://www.oecd.org/corruption/high-acquittal-rate-jeopardises-finland-efforts-to-combat-foreign-bribery.htm. OECD, “Implementing the OECD Anti-Bribery Convention, Phase 4 Report: Finland,” report, March 2017, http://www.oecd.org/corruption/anti-bribery/Finland-Phase-4-Report-ENG.pdf. “Patria Is Negotiating In Poland the Sale of Its AMV Business In Hämeenlinna,” defense-aerospace.com (website), Nov. 18, 2018, http://www.defense-aerospace.com/articles-view/release/3/197699/patria-negotiating-sale-of-amv-business-to-poland.html.